Click "Add" to add new link, "Edit" to edit and "Delete" to delete existing links. 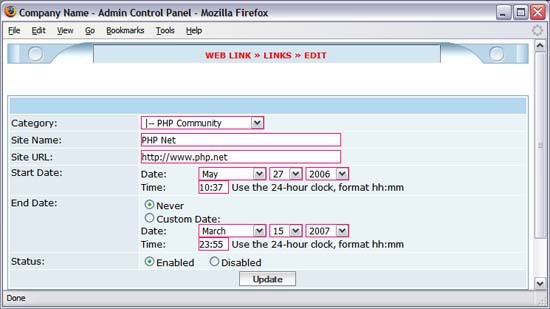 Click "Enable" to enable and "Disable" to disable checked links. All disabled links won't be displayed on your website. Click "Move to Category" to move checked links to one category. "Start date" and "End date": choose period for displaying link. Choose "Never" if you would like the link will be display forever.